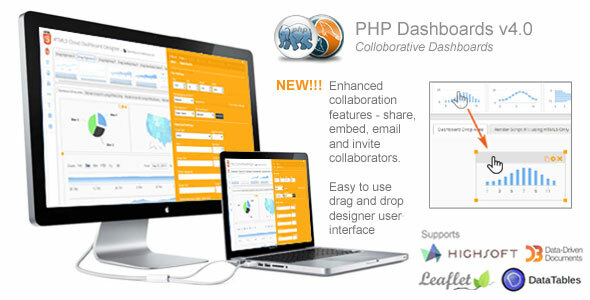 leverages the power of PHP/MySQL to create a collaborative platform for dashboard creation and sharing. What you will find in addition, is a way to save and share dashboard ‘js-fiddle style’ and allow you along with your collaborators to continue to maintain shared dashboard. Multi-tenant support has been added that allows anyone with an email address to create an account which can be used to keep track of dashboards you’ve created or you are collaborating on with others. Easy to use drag and drop dashboard designer user interface to create beautiful interactive dashboards in minutes. No coding necesarry!